His Majesty Rukirabasaija Agutamba Solomon Gafabusa Iguru I, by The Grace of God, Omukama of The Kingdom of Bunyoro-Kitara, Ruler of Hoima, Masindi, Kibaale, Buliisa and Kiryandongo, The Grandson of Kabalega, The Healer, The Orphan Protector, The Hater of Rebellion, The Lion of Bunyoro, The Hero of Bunyoro, The Hero of Kabalega, etc. etc. etc. – is the 49th Omukama of The Kingdom of Bunyoro-Kitara, 27th Omukama in The Babiito Dynasty, The Sovereign Head of The Royal Order of Omujwaara Kondo and The Royal Order of Engabu, and The Sovereign Head, Grand Master and Protector of The Most Honourable Order of Omukama Chwa II Kabalega. Born in 1948, the son of Omukama Sir Tito Gafabusa Winyi IV, CBE, he acceded to the throne upon the restoration of the Ugandan monarchies under Statute 8 of 1993 and is constitutionally recognized under Chapter 16, Section 246 of the Ugandan Constitution of 1995. Under Amendment (No. 2) Act 1995 he is the titular head of the regional government and assembly of Bunyoro-Kitara and opens, addresses and closes sessions of the assembly. 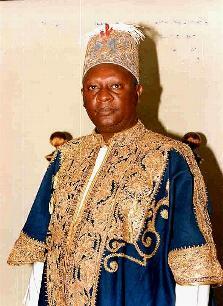 With his seat at the Karuziika Palace, Hoima, he is married to the Omugo of Bunyoro, Margaret Karunga.